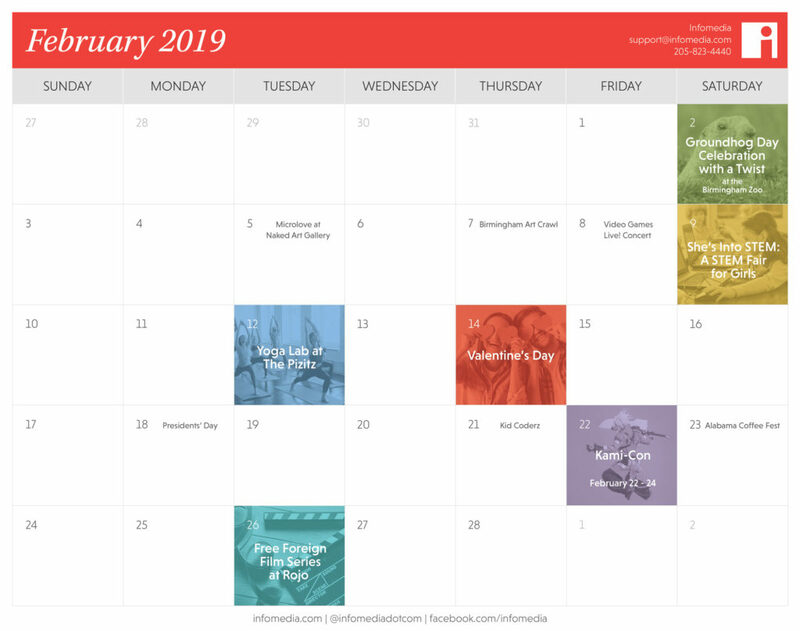 Our Free February 2019 Birmingham Calendar is Here! | Infomedia, Inc. Traditional Groundhog Day celebrations entail, well, a groundhog. But the Birmingham Zoo decided to mix it up this year by using a different mammal. Since the zoo’s current groundhog will be hibernating, one of their many opossums will take his honored place in predicting the winter weather. The event will include crafts, a wildlife show and animal photography opportunities. Get ready for Valentine’s Day early with the Naked Art Gallery’s romance-themed Microlove event. Featuring jewelry, miniature art and other handmade goods, you’re sure to find a unique gift for your sweetheart. Get your local art fix, and grab some good food and drinks, with the monthly Birmingham Art Crawl at The Pizitz. The event features local artists, craftspeople and more all sharing their creations. Gaming geeks will be excited to hear their favorite soundtracks come to life at the Video Games Live! concert. It’s an immersive concert that includes synchronized visuals and interactive segments. Put on by the AAUW Birmingham Branch and Girls Inc. of Central Alabama, this event focuses on introducing girls to the STEM fields. The day will involve meeting women in prominent STEM positions, lots of interactive sessions and getting involved with peers who have similar interests. STEM Fair for Girls is totally free and open to girls in 6th through 12th grade. Take part in a community yoga class at The Pizitz. This event is totally free and open to all levels of fitness. As a bonus, a free wine tasting is offered at the Louis Bar immediately after class. Spend the day with your sweetheart going to all the fun events Birmingham has to offer. Catch Casablanca at the Alabama Theater, grab a meal at the Valentine’s Day Pop Up Dinner at Carrigan’s or go a weird route with it by visiting Warehouse 31’s Bloody Valentine Haunted House. Presidents’ Day is a statewide holiday in Alabama, so many people will be off work and children will be out of school. Enjoy your time off with friends and family! Introduce your children to the basics of programming with the Kid Coderz class. Hosted at the Homewood Public Library, the class is open to kids in grades K through 1st and bringing your own laptop is encouraged. Nerds unite at the 11th annual Kami-Con. It’s a three day convention focused on all things Japanese, cosplay, anime, manga and more. Visit to meet your favorite voice actors, compete in costume contests or just to snag some cool merch. The most enthusiastic of coffee connoisseurs will be excited to learn about the Alabama Coffee Fest. Presented by Alabama Multicultural Organization (AMOR) at the Cahaba Brewing Company, the event will include presentations by Alabama coffee vendors, unlimited tastings and live latte art demos. Dive into the world of international cinema with the Alabama Multicultural Organization (AMOR) and Sidewalk Film Festival’s free foreign film series at Rojo. The month of February will focus on a movie from Germany.